The guess here is that Valentin resurfaces in No. 22, a number that last season belonged to Xavier Nady then to Michael Tucker. In other news the Mets dealt Nov. 15 for outfielder Ben Johnson (No. 4) and pitcher Jon Adkins (No. 57) of the Padres: Going to Petco are relievers Heath Bell 19 and Royce Ring 43. Should Johnson make the roster, he could remain in No. 4 since it doesn’t appear Chris Woodward is coming back. The Mets further cleared their roster of homegrown relief prospects by sending a pair of hard-throwers, Henry Owens and Matt Lindstrom, to Florida for two lefty projects: Jason Vargas and Adam Bostick. Owens made a brief appearance for the Mets last season wearing No. 36; we might have smelled a deal cooking in back in September when the Mets issued that number to a backup catcher, Kelly Stinnett. Vargas, who wore No. 56 for the Marlins last season is the guy with the best chance to make something of himself though he hasn’t done so yet. Bostick has yet to crack the majors. Also: Vetejourneyutilityman Damion Easley was added as a free agent. Easley’s been everywhere, man, but most recently in Arizona and Florida, he was wearing No. 2. That number currently belongs to coach Sandy Alomar. Just great to see former Met Edgardo Alfonzo rescued from the indignities of independent league ball and given another shot by the Mets at AAA Norfolk, isn’t it? While a minor league contract for the (alleged) 32-year-old infielder, released by two other organizations already this year, may not amount to much, we can’t help but get ahead of ourselves and recall the warm fuzzies of Lee Mazzilli’sheartwarming return to the organization he gave the best years of his life to, and just in time for the postseason he might have deserved but never smelled. While Fonzie knows from playoffs, his departure from New York after the 2002 season never sat well with good fans like us, even if we’ll admit under torture that it might have come at the right moment considering the direction his career — and the Met fortunes — would go since then. But as a right-handed bat on the bench? We’ll sign up for that, if and when the need arises. And let’s suppose it does. Would Billy Wagner surrender No. 13? Or is he the jerk his former teammates say he is? 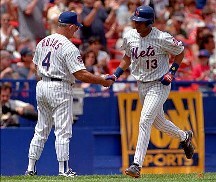 Ironically, the Mets faced a similar quandary when Mazzilli returned 20 years ago: His familiar No. 16 at that point of course belonged to Dwight Gooden, so he foretold the future glories of Edgardo Alfonzo and suited up in 13. Wagner of course is no Doc. Saturday’s disaster in Chicago resulted in a quick demotion for hard-throwing reliever Henry Owens 36. Taking his place in the bullpen is Heath Bell 19, recalled from Norfolk for the third time this season. 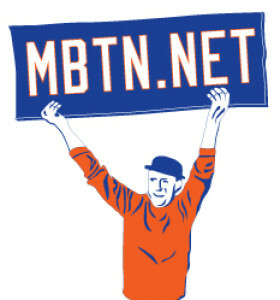 The Mets combat the Marlins this weekend with lots of new faces. Friday’s starter and loser, Jose Lima 17, was designated for assignment (again) following a regretful outing (again) Friday; his place will be taken by top draft pick Mike Pelfrey, who starts Saturday’s Game 2. Pelfrey wore No. 47 with Binghamton, but — this just in — is listed at No. 34 for his start today.The Mets have rarely had a 34 of great success, but it’s hardly been for a lack of trying: Pelfrey is the 30th Met to dress in those digits and the second this year — making 34 the 2nd most frequently issued jersey in Met history. While it may be too much to expect Pelfrey to carry on the legacy of Nolan Ryan (1966), we can hope his success exceeds that of, say, Blas Minor (1995-96) or Jorge Julio (2006). Good luck, Mike! Pelfrey’s B-Met teammate, Henry Owens, wound up with the roster slot vacated when Pedro Martinez 45 made his mid-summer break official with a trip to the DL to rest an ailing hip (Heath Bell was initially recalled, but the retroactive dating of Petey’s DL stint prevented Bell’s activation). Wearing the No. 36 jersey last worn by Manny Aybar, Owens fired an impressive inning of mopup work in his big-league debut tonight.